This portable toilet rental cost guide can be useful to you if you're planning a big event, whether it be a wedding, camping trip or other outdoor activity, having portable restrooms available is a great idea with large crowds in attendance. One of the best parts about paying a portable toilet company is having them deliver and pick up the portable toilets when your event is over with. This completely eliminates the stress of having to figure out the logistics yourself. Not only does hiring a portable restroom service company add convenience, they decrease the probability of attendance dropping in numbers throughout the event. People are a lot more likely to stick around if they have easy access to a restroom. If they don't have access, they'll probably leave with a small chance of returning. If you're a contractor, you already know that the cost of portable toilet rental on your construction site is an unavoidable expense. Otherwise your workers will be leaving to use the bathroom elsewhere and then having to return to the work site. Time is money, and this is an expense you will always have to accept in your line of work. There are a few different questions you'll want to ask yourself before you can get accurate portable toilet cost estimates for your job. The first obvious thing you'll want to figure out is the estimated number of people you believe will be attending your event. Next, it would be helpful if you knew roughly how long the event is going to run for. Don't forget to take into consideration what the weather will be like. Also, you'll need to make note of the amount of food and liquid consumption that will be taking place at your event. Lastly, one of the most common things that is forgotten is the consideration of the the level of physical activity that people will be doing at your event. All of these play important roles in determining your portable restroom needs. If you can figure all of these out, your experience with renting and providing portable restrooms should be a smooth experience. Pricing on portable restroom rentals varies throughout the country depending on how long you're needing to rent them for, and what quality of portable restroom you want. You can expect the standard portable restroom costs to include toilet paper and hand sanitizer at the least, and possibly a sink with soap and paper towels to dry off with. Are Portable Toilet Prices For Your Event Too Expensive? 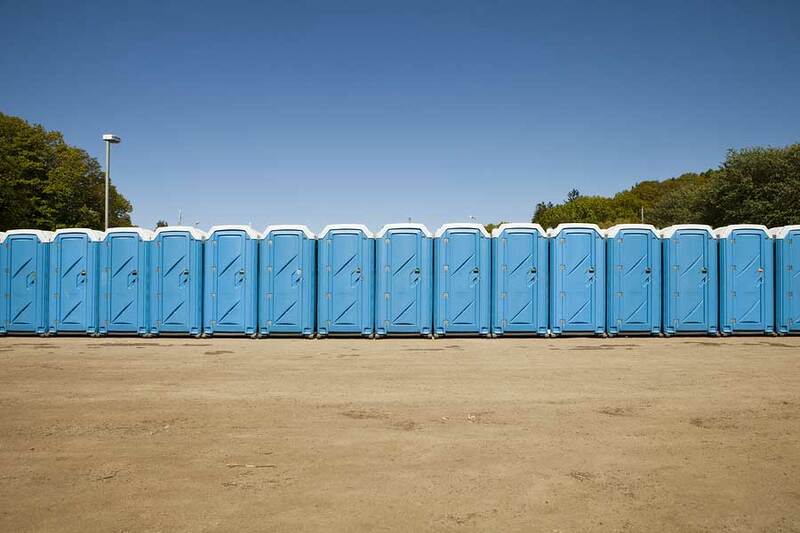 It's common for event planners to consider of portable toilet costs as an after thought or lump them into an emergency fund. Generally speaking, people would much rather use the bathroom at a restaurant over a portable restroom. You might be hesitant to pay full price for portable rental at your wedding when there are so many other costs you are incurring. This is perfectly understandable. If such is the case, there are a few things that the Portable Sanitation Association suggests you can do in order to justify your portable toilet rental cost for your big day. First, you can put a small floral arrangement inside each portable restroom. Flowers can always be appreciated. Second, you might want to consider having some sort of fragrance to distract from potential not-so-pleasant fragrances that portable restrooms naturally have. Lastly, if you really want to impress guests at your event, you could include small baskets full of various toiletries such as lotion, cologne, perfume, sunscreen or even bug spray. According to gotugo.com, Portable toilets use 90% less water than the average conventional toilet. Not that people would do this, but can you imagine how much water we would save if we only used portable toilets? Just to give you an idea of how may people supported President Barack Obama at his inauguration, there were 5,000 portable toilets there for the public to use. You can use the chart above and do some calculations and get an idea of roughly how much that bill turned out to be. As for the most unexpected fun fact, the U.S. spent over $100,000 to conduct a survey in order to determine if people prefer having the flap in the front or back when the roll of toilet paper is in its holder. They found that having the flap in the front is most common.